This product requires the base game Block N Load. 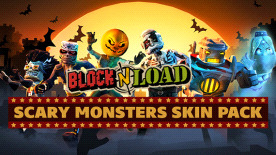 Give your enemy the fright of their lives with the Scary Monsters Skins Pack. Suitable for any violent occasion, this pack contains six Scary Monsters outfits so your heroes can make a killing in the arena. The time is always right to look like a fright! The Mechanical Mummy Skin: The bandages keep his nuts and bolts in place and now he's stomping out to be a cruel trick and violent treat. Fallen Nigel Skin: You can't keep a military man down. Nigel is missing some important parts but back up and fighting. Nightmare Genie Skin: Haunt your enemies day and night in this devastating ghostly form. YOU HAVE QUESTIONS, WE HAVE ANSWERS! Q: What do I get in the pack? A: 6 hero skins. NOT THE HEROES. Just the skins for those heroes. Watch the video and look at the screenshots. They're horror-tastic. Q: What happens if I don't own any of those heroes already? A: The skin for the heroes will wait in your account in-game. When each hero is on free rotation or you choose to buy them, it will become available immediately. The skins are yours and you own them, no matter what. Q: What happens if I bought one of these skins from the game store already? A: You buy this pack and get the six. If you've bought one already, that's AWESOME but alas it won't be replaced for anything else. Q: I skipped straight to this question, what have I missed? A: TL;DR - Get the pack already and save on the price of these skins. Q: Anything else? A: Negative. Get the skins or go about your business, reader. Dedicated graphics card (GeForce GTX 650 / AMD Radeon HD 7770 series or better). © 2015 Jagex Ltd. All rights reserved. Jagex® and Block N Load™ are trademarks of Jagex Ltd. Requires Block N Load (base game) to use this DLC.